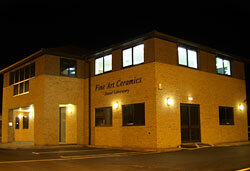 Based in the Midlands, Fine Art Ceramics is ideally located to service the whole of the UK. Just off the A5 - close to the M1, M69, M6 and M42 motorways, the Laboratory is situated in the beautiful surrounds of the Leicestershire countryside and easily accessible by road. Leave at junction 21 and join the M69 Exit the M69 at junction 1 and turn right to join the A5 (northbound towards Leicester). After approximately 6 miles, turn right onto the A444 (Atherstone Road). In 4 miles turn right again onto Bosworth Road. Keep forward onto the Wellsborough Road and then Station Road. You will find Fine Art Ceramics on the right hand side just after the crossroads. Leave at junction 18 and turn left to join the A5 (northbound towards Leicester). Continue for approximately 15 miles, crossing the M69 roundabout. Continue forwards for another 6 miles then turn right onto the A444 (Atherstone Road). Leave at junction 2 for the M69. Continue for just over 5 miles and exit at junction 1. Turn left onto the A5 (northbound towards Leicester). Follow directions for M6 Southbound. Leave at junction 10 and turn right onto the A5. After approximately 8 miles turn left onto the A444 (Atherstone Road).